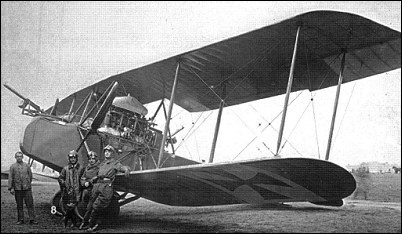 A development of the AEG G.I and powered by 112kW Benz Bz.III engines, the G.II of mid-1915 was a slightly larger version of the G.I, armed with up to three machine-guns and 200kg of bombs. A number of these aircraft had at various stages, single or triple vertical tail surface on each side of the fin and rudder. About 15 G.Is were built before the type was superceeded by the G.III. Engines: 2 x Benz Bz.III, 150 hp.